We didn’t know very much about the Philippines as it’s not really a destination that’s marketed much in New Zealand. 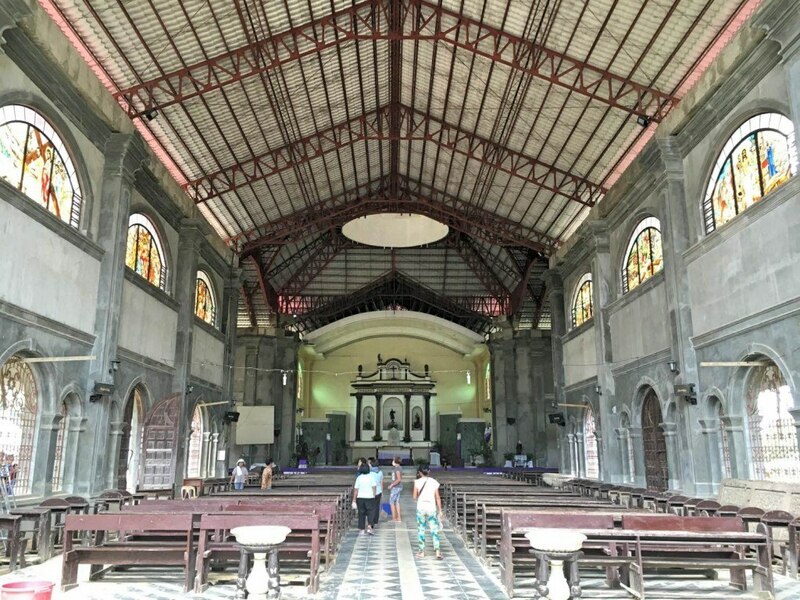 But we had heard people rave about the beauty of the tiny island of Boracay, and were intrigued by the chocolate hills and tarsiers of Bohol. 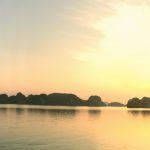 We found some cheap flights and off we went! 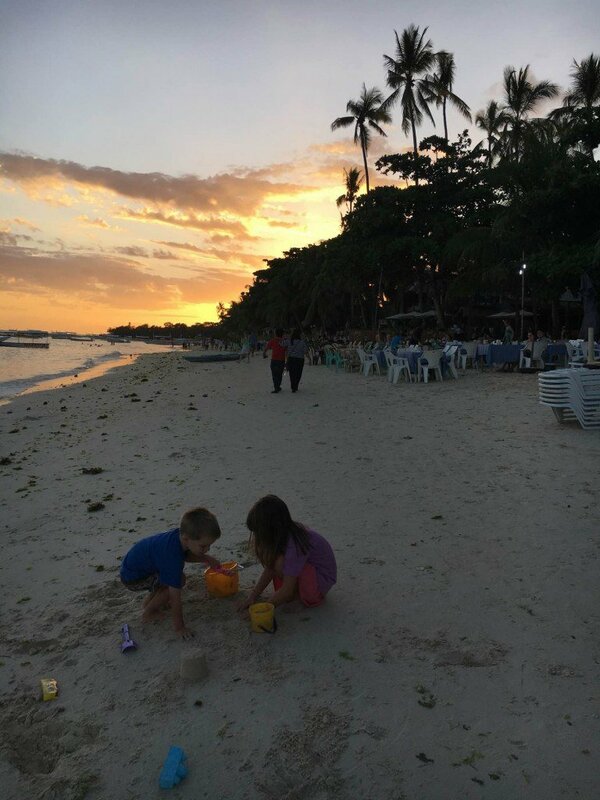 We split our time between Boracay – 3 nights initially and then we flew down to Bohol for a week. 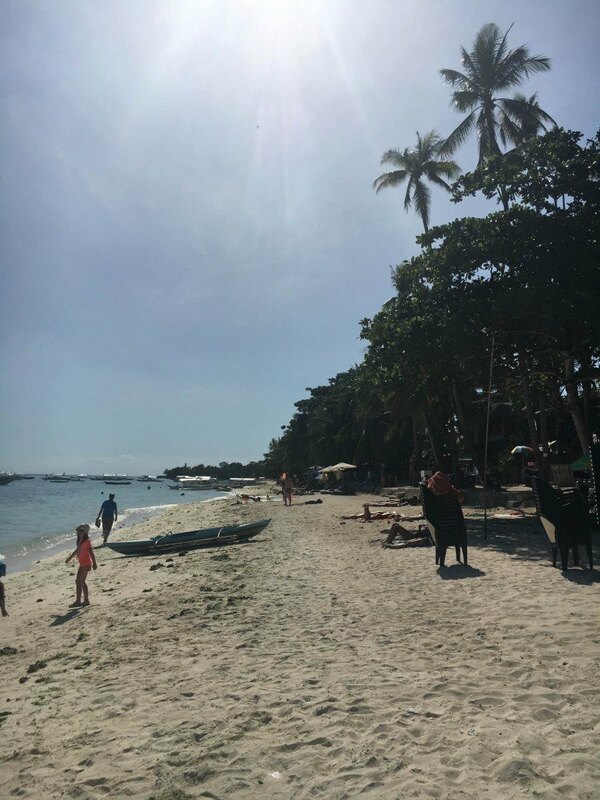 Then it was back up to Boracay for a further 4 nights. This was a lot of travel, given most of it was in taxis or ferries – the Philippines is huge (made up of over 7,000 islands!) But it was so worth it. 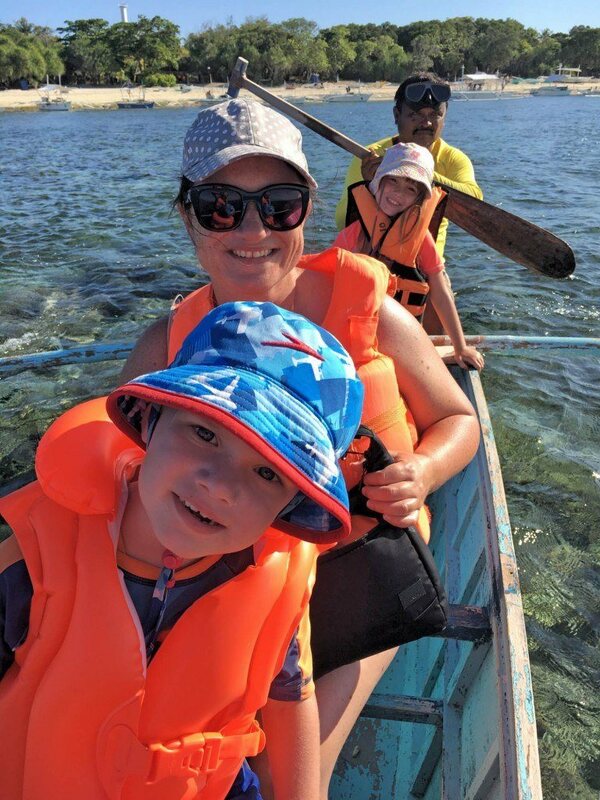 A magic day was had by all when we hired a boat and left at dawn to go dolphin watching, en-route to snorkelling coral reefs at Balicasag Island. 5.30am and good to go. Unfortunately we didn’t spot any dolphins – apparently we’re the first people in the history of trips to Balicasag Island never to see any! A bit disappointing for the kids but it was still a great ride watching the sunrise over the crystal clear ocean. 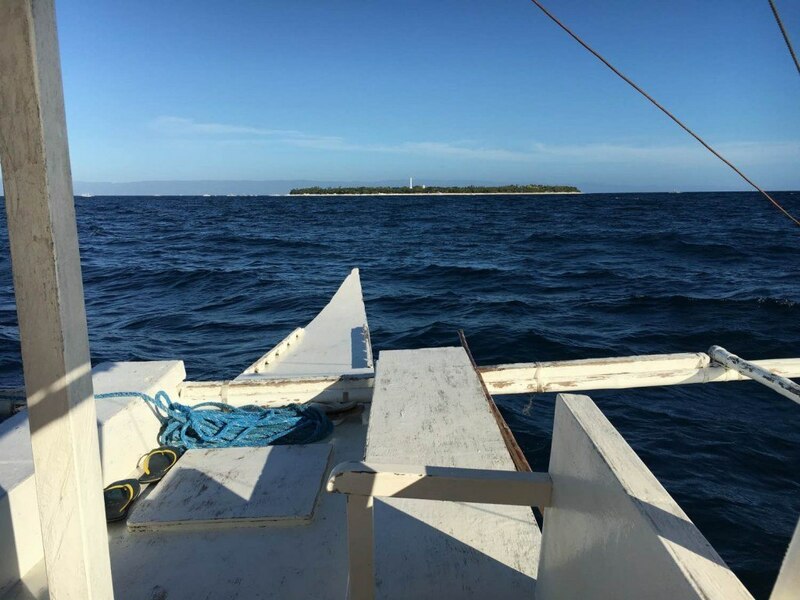 Once we got to Balicasag Island, we swapped to a smaller boat and got rowed about 150m off-shore to go snorkelling over the reef. In the small canoe headed for the reef. 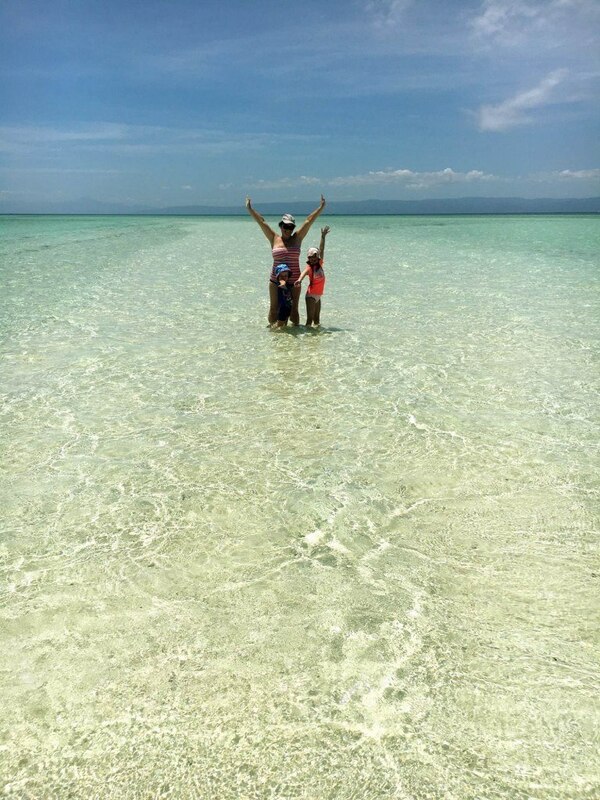 We saw hundreds of beautifully coloured fish, a couple of snake fish (heart-stopping moments as they look exactly like sea snakes), and amazing coral formations out on the edge of the reef. Sophie had a go at snorkelling and Jack was content floating around in his floaty looking at some of the fish from the crystal clear water above. From there we rowed another 50m over to see some giant clam shells and swim with sea turtles. The turtles were beautiful to watch as they gracefully glided through the sea beneath us. They were huge! Mike and I followed one out to sea from the reef and it was an amazing sight to see. 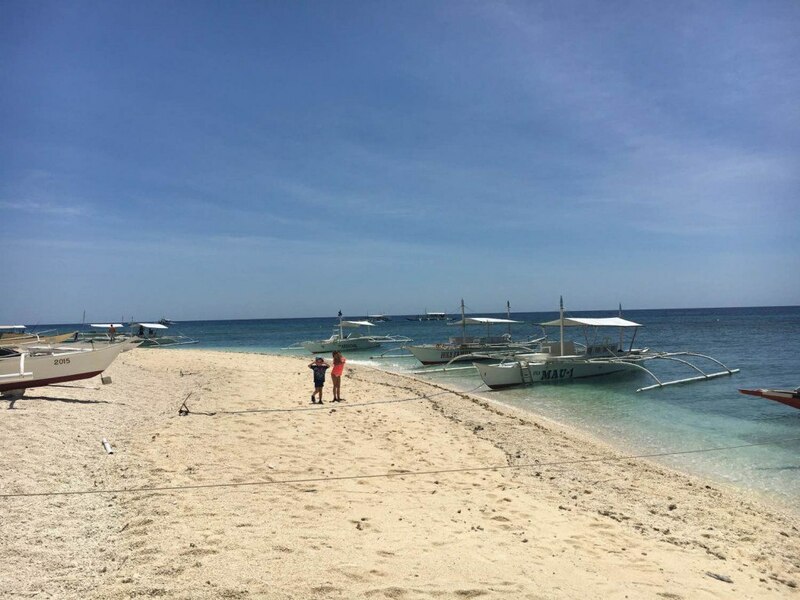 As part of our Balicasag boat trip we stopped on the way back at Virgin Island, which is actually a semi-submerged sandbar in the middle of the ocean. We had fun running up and down the sandbar and having a little swim. There are a couple of enterprising vendors who’ve set up stalls on the sandbars and you can get them to grill you up some seafood or buy a drink. It’s very cool. 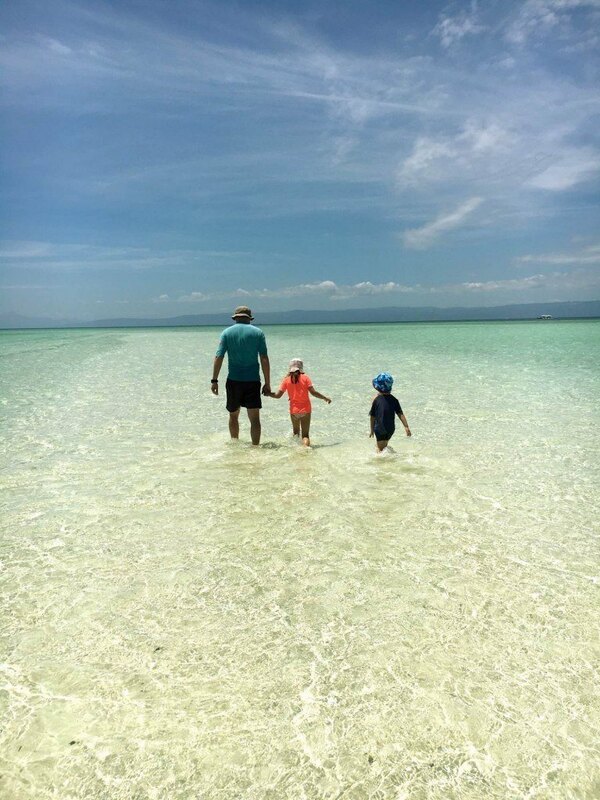 We stayed on Pangalao Island, which is at the bottom of Bohol and home to Alona Beach. 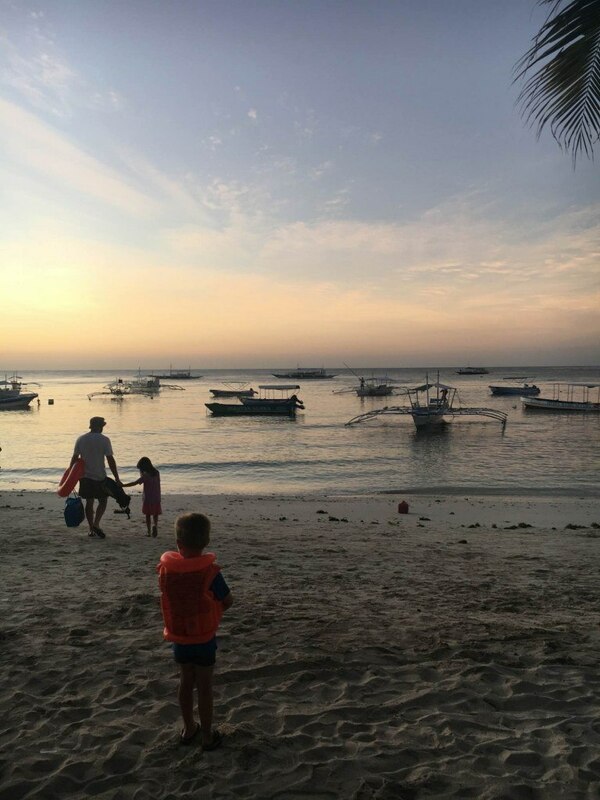 This strip of chilled-out beach bars and restaurants was the perfect place to swim during the day, then watch the beautiful sunsets with a cold beer in hand while the kids made sandcastles. The beach itself wasn’t as nice as some of the ones on Boracay with a bit of seaweed, and there were lots of boats in the harbour, but we still enjoyed swimming there and it was nice to stroll along the water’s edge. Handy hint: It’s worth bringing a pair of reef shoes to wear in the water as there is a lot of washed up coral underfoot. Also watch out for sea urchins! Sophie picked one up while shell hunting as she thought it was a baby coconut. She got stung on her pinky finger and her howls bought all the locals around who said ‘get her to do pee pee on her hand’. Much too her disgust I marched her into the toilet of the bar and got her to do the deed and sure enough the pain stopped! 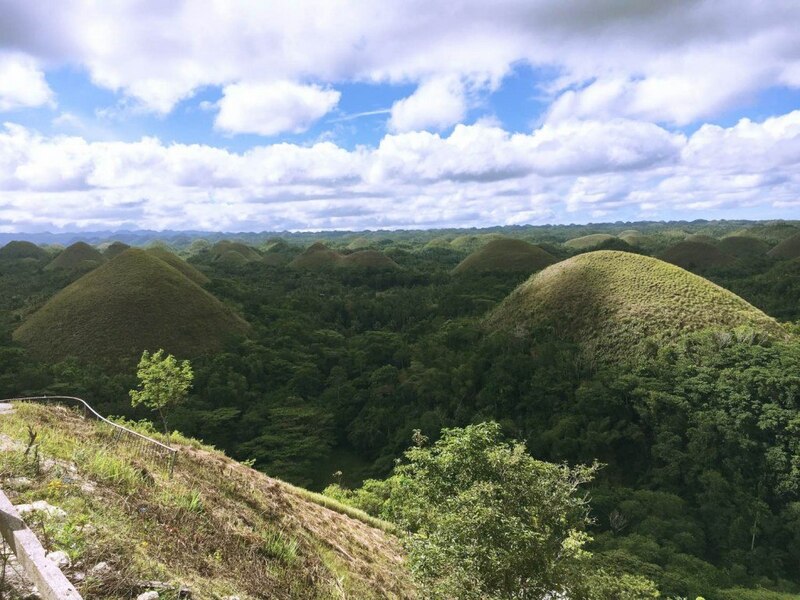 The Chocolate Hills are an amazing series of over 1,200 grass covered limestone mounds that crop up from the earth as far as the eye can see. 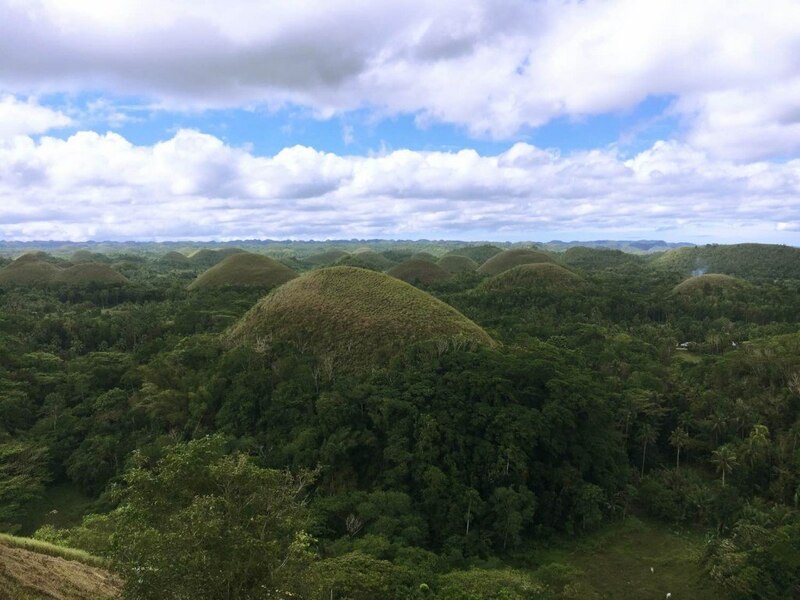 They’re called ‘chocolate hills’ because they go a brown colour during the dry season. It was really interesting to check out and these photos don’t really do justice to how cool it is. 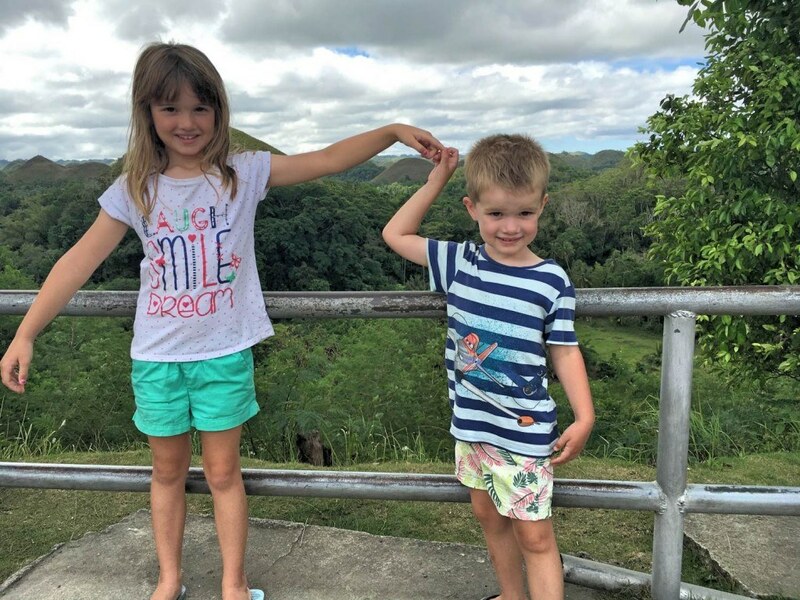 The kids trying to do the obligatory ‘touching the chocolate hills’ shot. The kids were initially quite excited to go here as they thought we would be literally eating chocolate hills! They were a bit bummed out when they found out they were made of stone and grass. 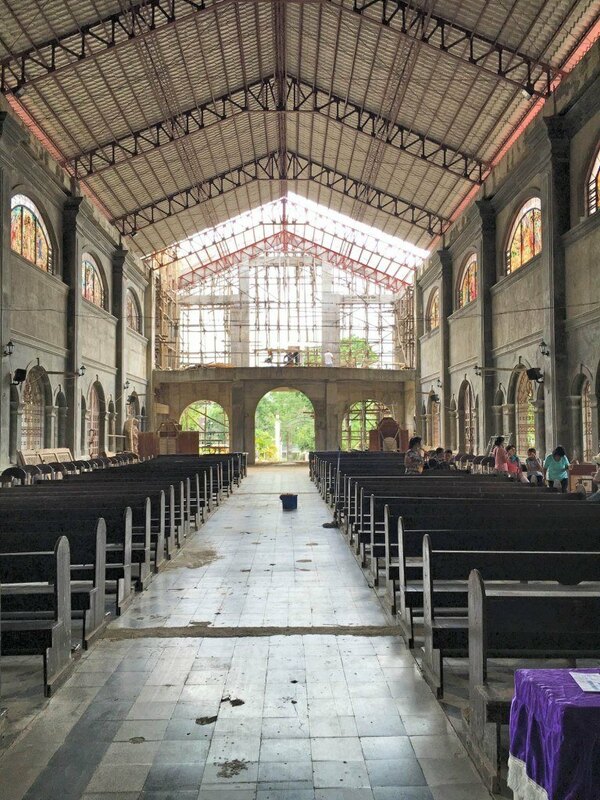 The Philippines is predominantly a Catholic country, so lots of beautiful centuries old churches dot the landscape. 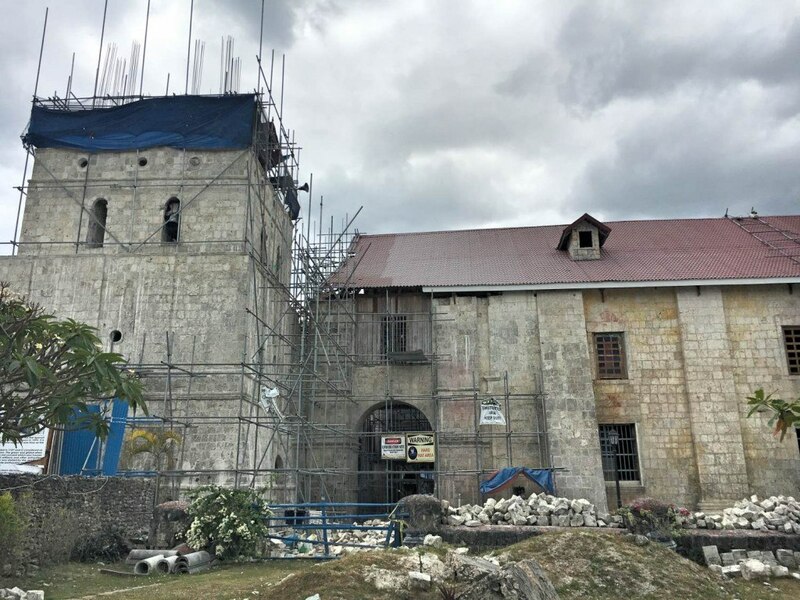 Bohol was struck by a 7.2 earthquake in 2013 that killed and injured hundreds of people and did major damage to a lot of buildings including devastating a lot of the big churches on the island. We drove past many that were in various states of repair and went inside to have a look at one. The local people were holding a working bee while we were there and had stopped for morning tea when 4 New Zealanders rocked up to have a look much to their amusement! A makeshift roof and entire new front is being constructed. 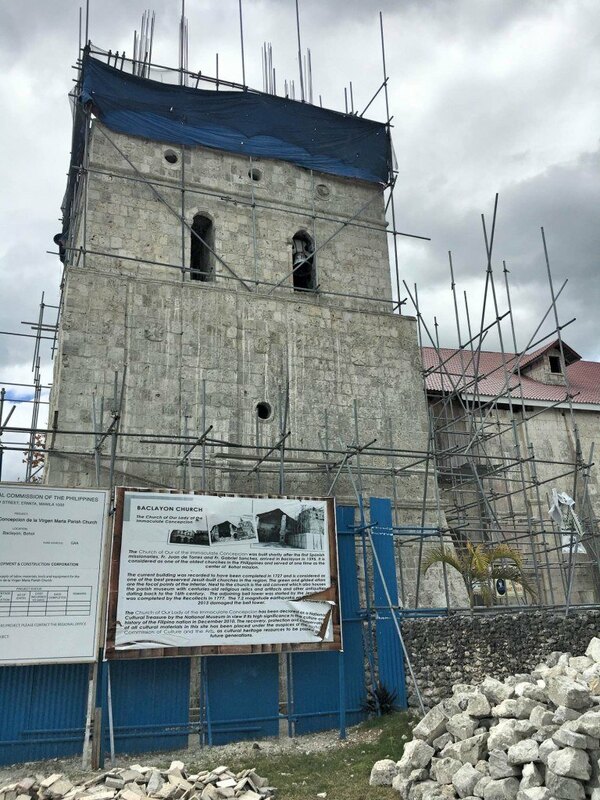 We also stopped to look at the outside of Baclayon Church which dates back to 1596 and suffered major damage with the collapse of the bell tower and portico. 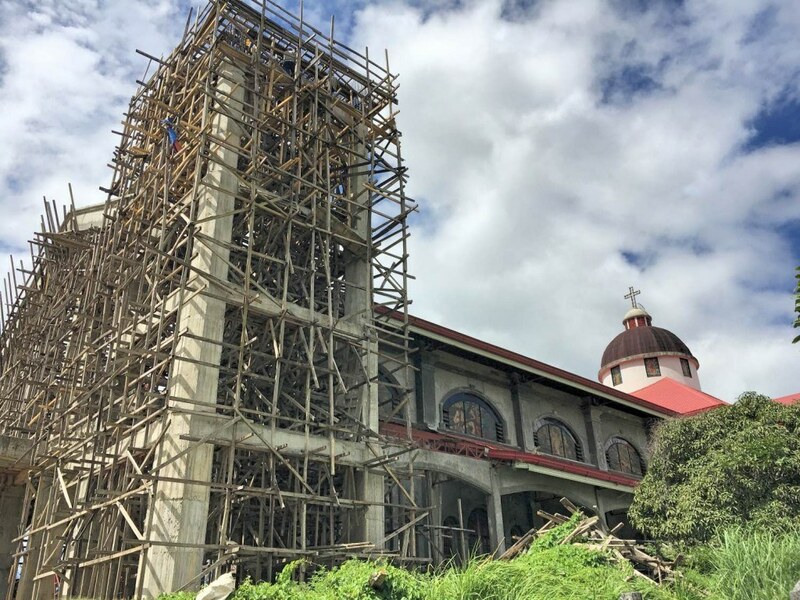 It is still being repaired. These sights reminded us sadly of Christchurch in New Zealand and the cathedral there. Tarsiers are one of the world’s smallest primates and also one of the most endangered. 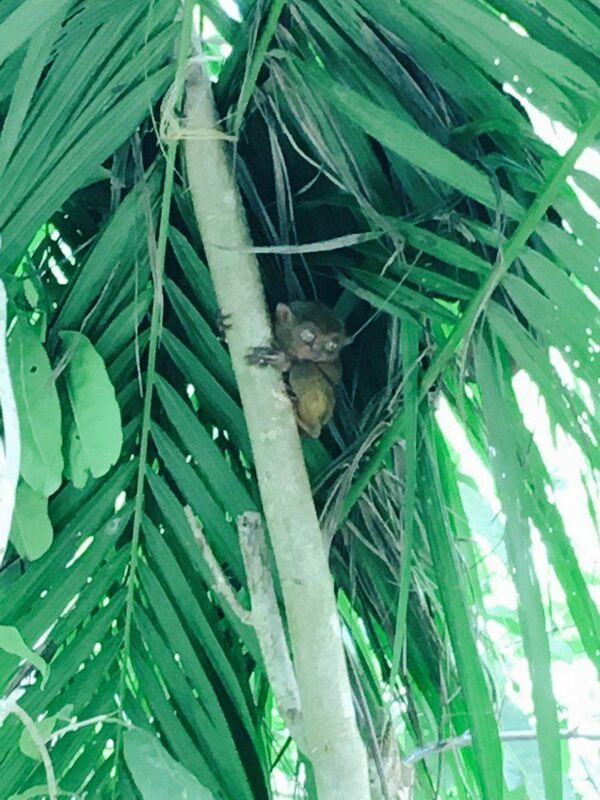 We went and visited these cute little critters at the Tarsier Conservation Area, which is a patch of forest that has been put aside to protect the tarsiers. They are nocturnal but we caught some of them stretching mid-nap as the guides (who were a little bit full on) led us to where they all were. The ‘guides’ were keen for us to do some cheesy poses like this one with a tarsier ‘sitting’ on Jack’s finger. We weren’t that into it! 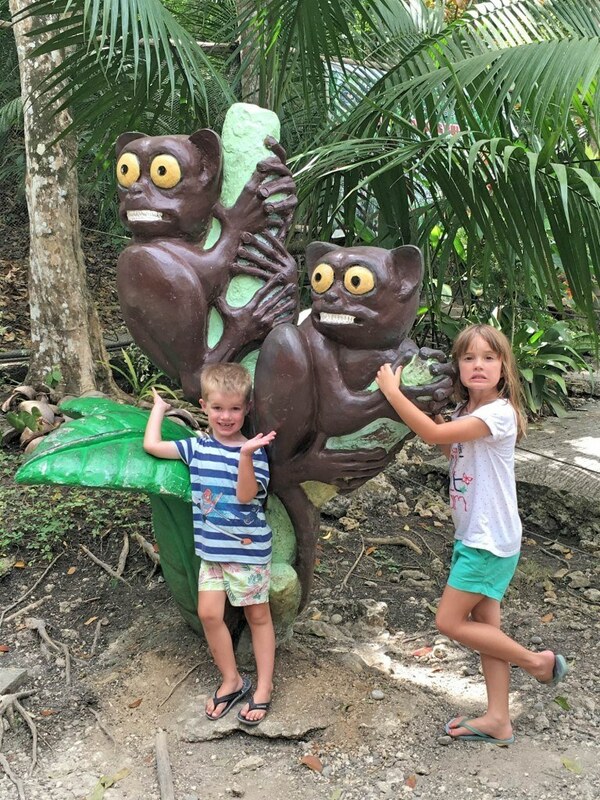 The kids loved seeing them and as they’ve recently seen the movie ET (who is based on a tarsier apparently) they thought it was pretty cool. 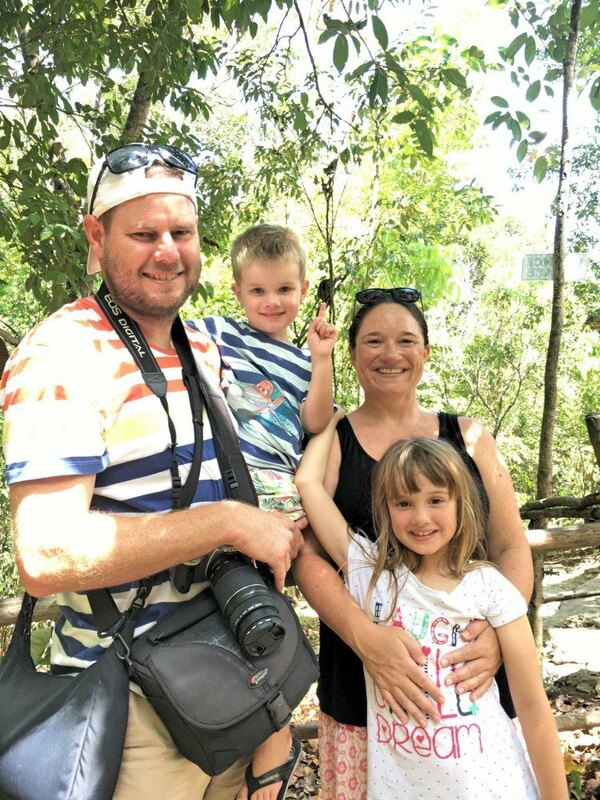 We think it was a legitimate operation – it’s so hard to know as everything is called a ‘conservation area’ or ‘sanctuary’ but you never quite know how good the animal welfare is there…. 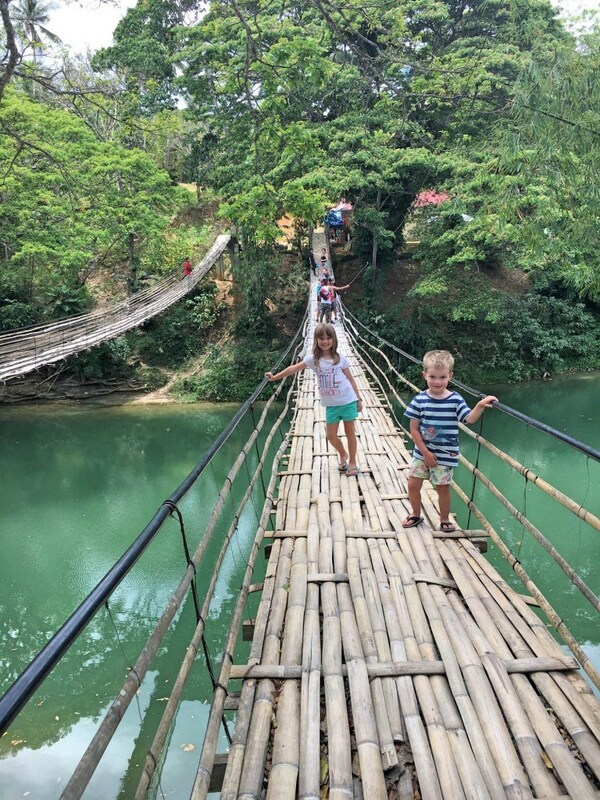 This one was a bit of a tourist attraction for the sake of a tourist attraction, but it was a lot of fun being brave and crossing the rickety bamboo bridge that hangs over the Lomboc River. Constructed of bamboo you have to hang on tight as it sways side to side. 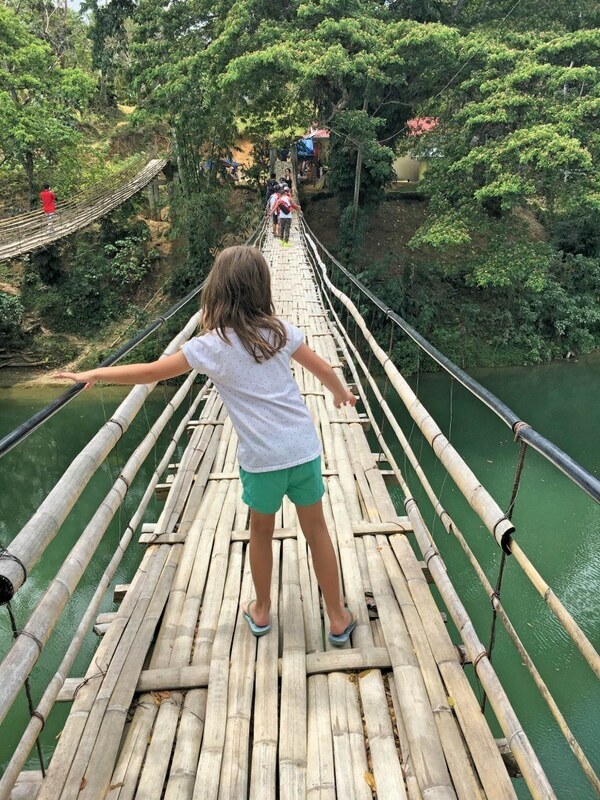 Try not to look down – easier said than done when you have to watch every footstep to make sure your jandals don’t slip through the bamboo slats! 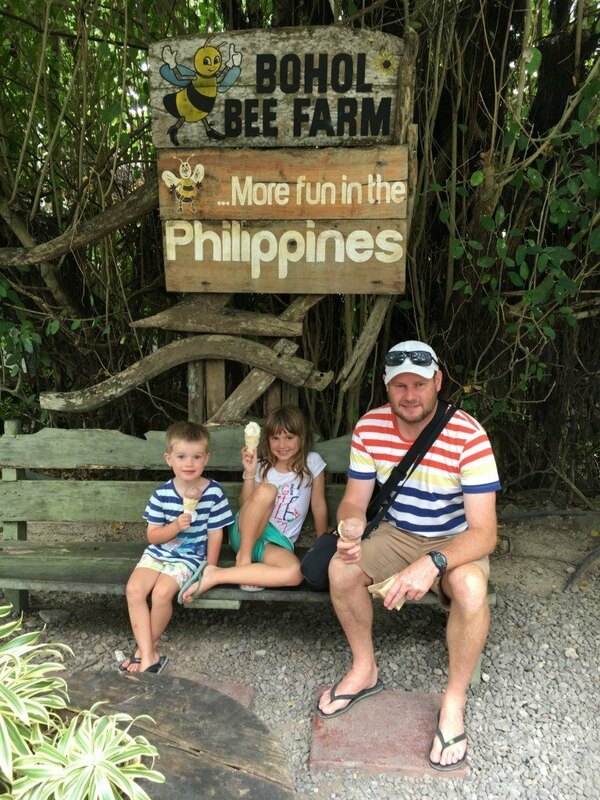 The Bohol Bee Farm is a lovely cliff top restaurant/bee farm/dive shop that has all kinds of honey related products on offer, yummy food and the best ice-cream! 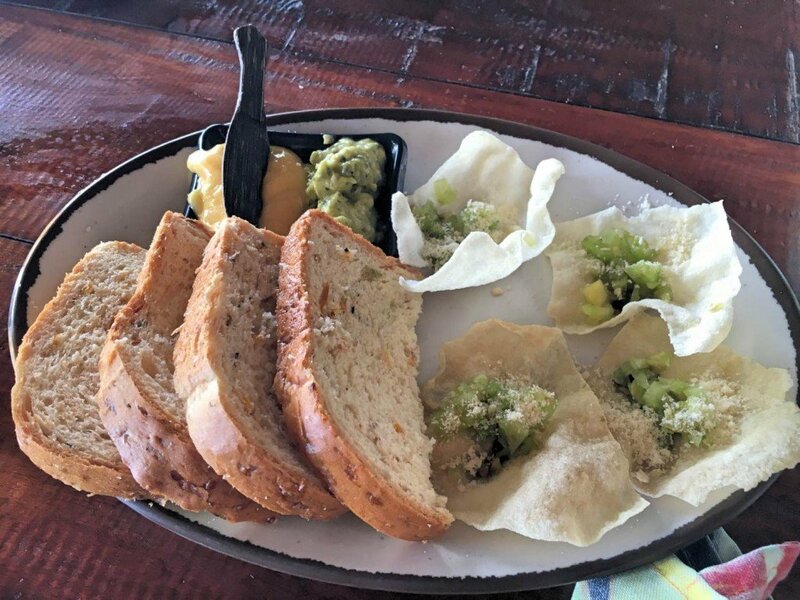 It’s made using a coconut milk base and has delicious flavours like salted honey, peanut kisses, mango, pandan, – and really nice cones made out of cassava. All for $1 NZD. Ice-cream, you scream, we all scream for ice-cream! 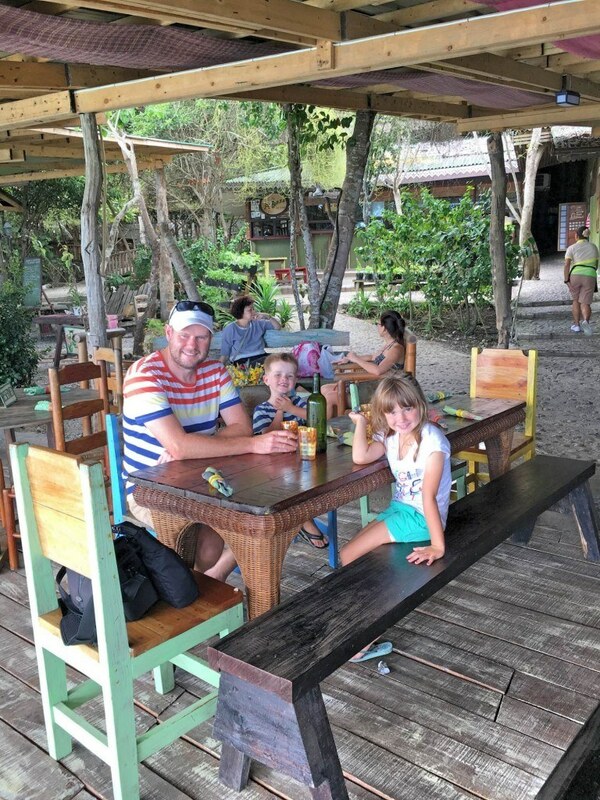 You can have a lovely lunch or dinner in the clifftop restaurant overlooking the ocean, wander right down to the sea where they offer diving facilities, do a tour of the beehives, a really interesting place. They also sell the ice-creams at a couple of places at Alona Beach. 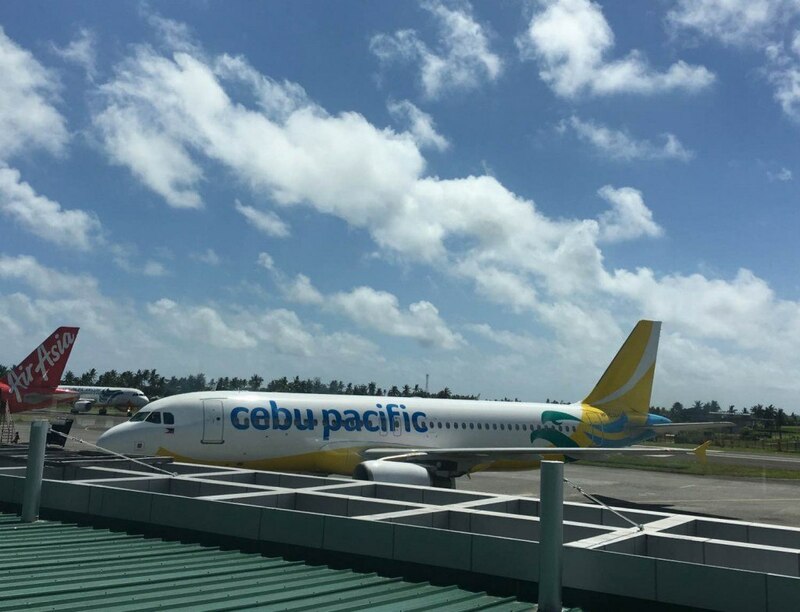 Our cheapie domestic flight with Cebu Pacific – $200 NZD return for the four of us. Our kids were going a bit stir-crazy by this point. It was at least 30+ degrees outside and mostly year round but they had this random banner inside the ferry terminal. Wishful thinking perhaps?! 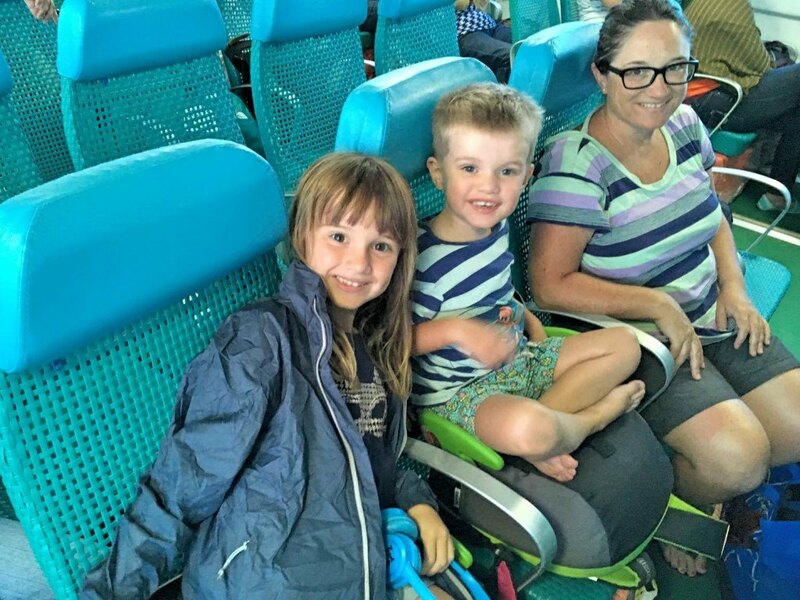 On board the Ocean Jet catamaran to Tagbiliran. 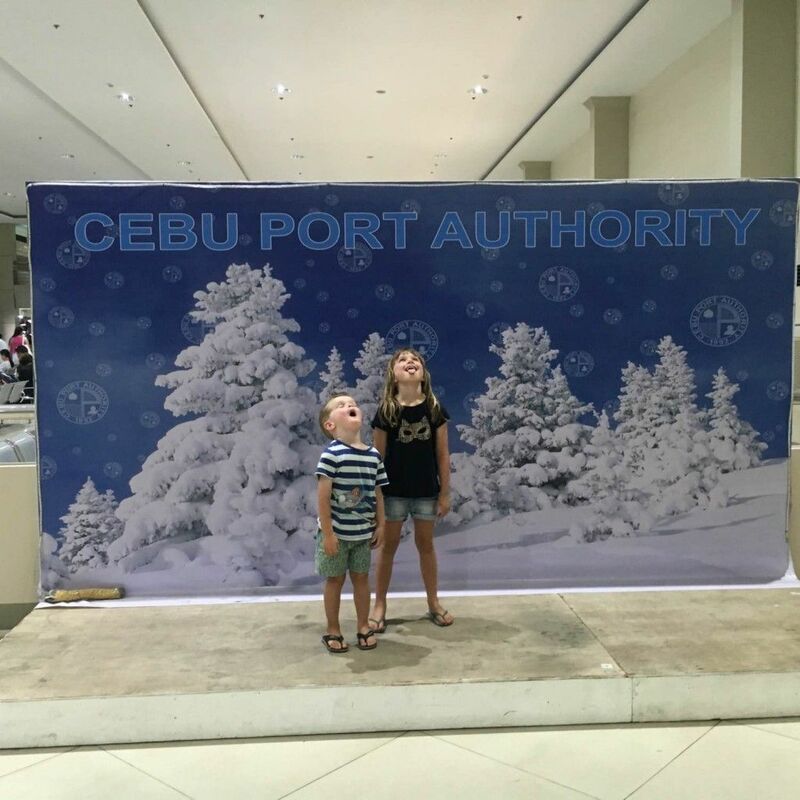 If you aren’t as crazy as us/better organised, get a direct flight to Cebu from Manilla or Kuala Lumpur and only do the last bit! 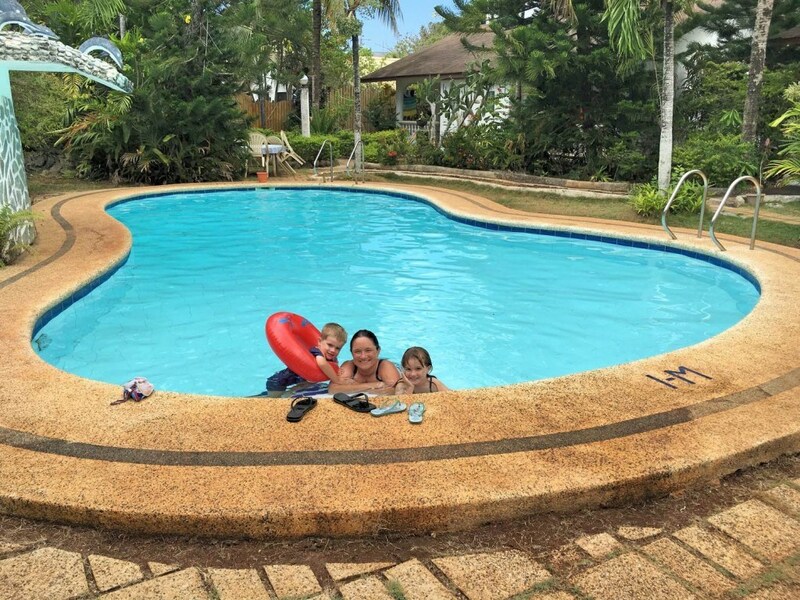 We stayed at the really lovely Flower Garden Resort, 10 minutes walk from Alona Beach which we’d highly recommend. We stayed in House 1 which was a great little standalone Swiss-style cottage complete with kitchen so we could cook some of our own meals. A brilliant Swiss deli is right next door. 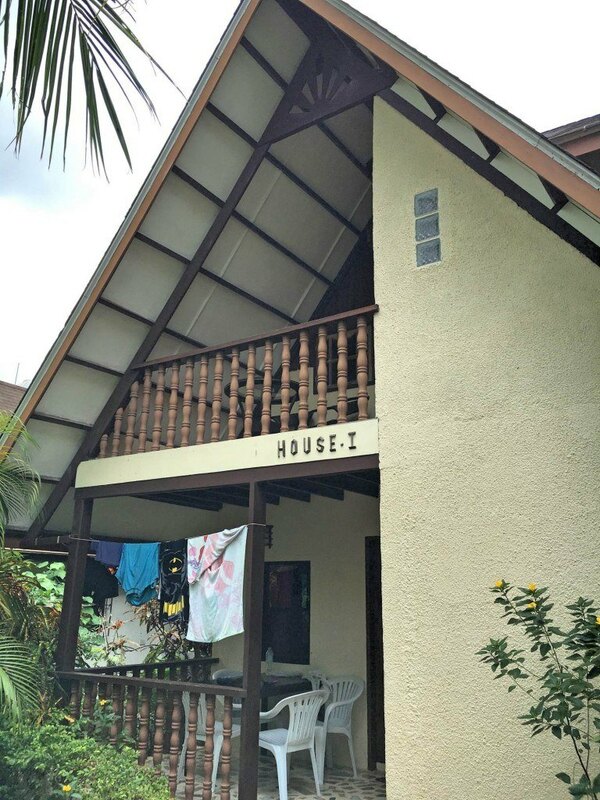 The interior is a bit ‘retro’ but it has good air conditioning and a fabulous pool with friendly owners and staff. Every day they top the fridge up with beers, water and soft drinks cheaper than what you can buy at the supermarket, win! 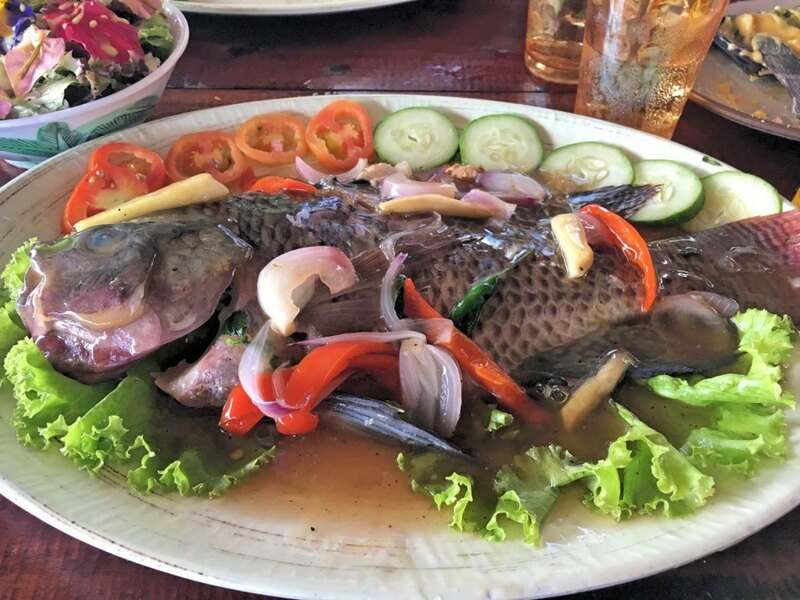 Grilled fish with coriander sauce and edible flower salads. 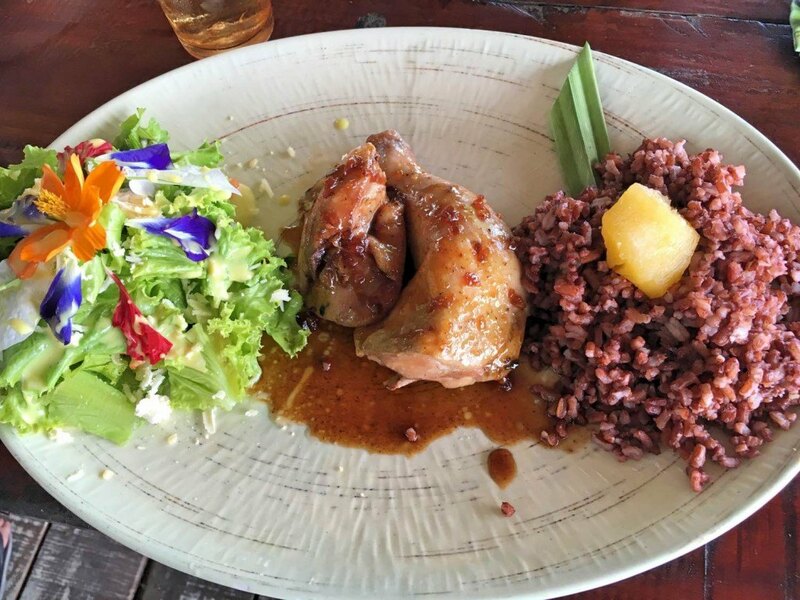 We did however think the food and service at the actual bee farm branch was better than the Alona Beach restaurant. Don’t forget to leave room for a delicious ice-cream! 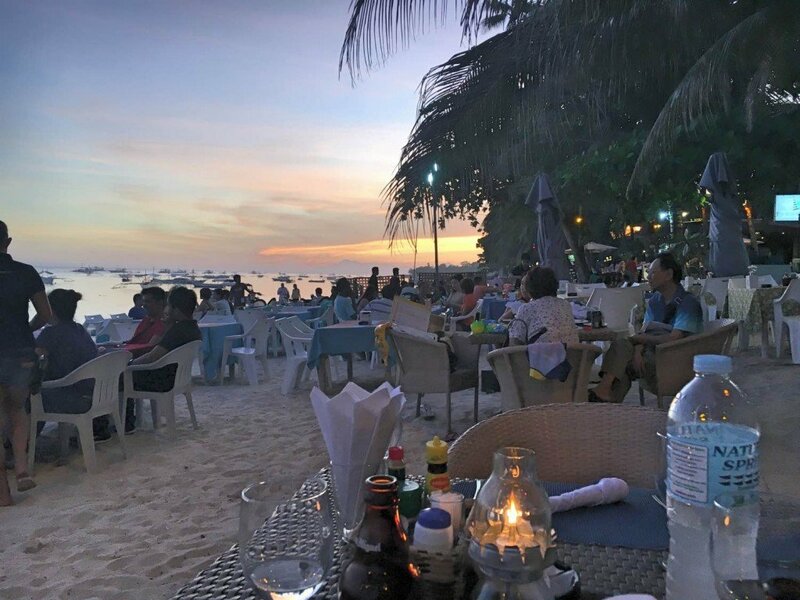 The Alona Beach area seems to be full of Swiss and German ex-pats, so there are a couple of delis and restaurants where you can get a fix of cheese, salami, sausages, sauerkraut and schnitzel. 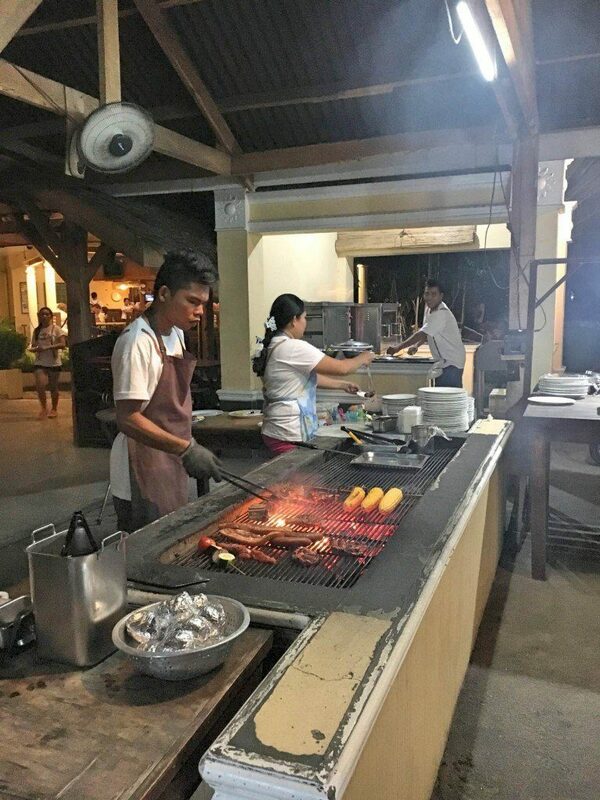 But they also do BBQ’s which are a Filipino favourite – choose your meat, vegetables and they grill it up for you and serve with a portion of rice. So while it was two days of travelling to get to Bohol and back from Boracay, we are really glad we went and saw some of the sights that this beautiful island has to offer. 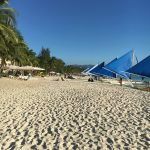 Next: Our week in Boracay – was it worth the hype?